With a long-held interest in film and television, Essex-born Thomas Davies chose LSBU because of its film facilities, amazing studio and high-quality equipment after completing a Level 3 Extended Diploma in Television and Film Production at South Essex College. Combining his undergraduate studies with work as a freelance film-maker, Thomas is certainly making his mark and was nominated for an NME magazine award for best music video in January 2017. One of the main reasons I chose LSBU was the facilities, and that has definitely proven to be a good choice, as in the Arts and Creative Industries school we have constant access to really high-quality film equipment and studio facilities. ''This is a massive bonus when you want to improve your skills by working as a film-maker while studying, and really helped me when I became involved in making music videos earlier this year,” he says. In January 2017 Thomas began working with Parlophone Records and Chelmsford-based musician RAT BOY. RAT BOY's music is a mix of several styles, most notably hip hop and indie rock, and he has cited his main musical influences as English bands such as the Clash and the Streets while also being compared to artists such as Jamie T and the Beastie Boys. His DIY approach to his art and music sees him generally recording and producing his own tracks at home and creating all his own album art. Many of RAT BOY’s songs consist of narratives and stories within the lyrics, as well as samples recorded of sounds and conversations from his daily life. In January, Thomas’s clip for RAT BOY’s ‘Get Over It’ was nominated for Best Music Video in NME magazine, while in May they collaborated again for the release of ‘Revolution’. The video was among the likes of clips by Paramore and Lana Del Rey when it made it to number 11 on the YouTube trending charts on the day of its release. 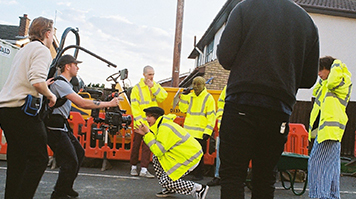 Thomas shot the video using LSBU’s Arri Alexa Mini camera, and says he hopes to continue working on music videos following the completion of his studies. “’Revolution’ is about a young person, growing up in a post-Brexit Britain. It depicts a hyper-realistic Essex, taking normal everyday things like Tesco or off licences and giving it a satirical twist. It's basically a daydream in modern, broken Britain. Compared with other projects that I have worked on, Revolution was a great project. In many ways, it was just like any other project, but on a scale where we are able to get creative with our ideas and concepts, almost enabling us to do anything we wanted.